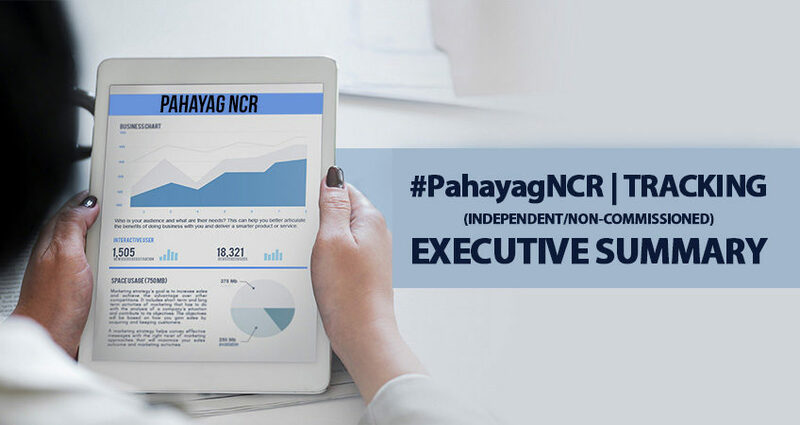 EXECUTIVE SUMMARY – FINDINGS OF PAHAYAG NCR TRACKING POLL - PUBLiCUS Asia, Inc.
PUBLiCUS Asia’s independent poll #PahayagNCR looked into the opinion of about 1,800 respondent registered voters from Caloocan City, Las Pinas City, Makati City, Malabon City, Mandaluyong City, Manila, Marikina City, Muntinlupa City, Navotas City, Paranaque City, Pasay City, Pasig City, Pateros, Quezon City, San Juan City, Taguig City and Valenzuela City. Field work was conducted on March 16-17, 2019. The margin of error is at ±2.31% for NCR-level and ±9.56% for city-level. 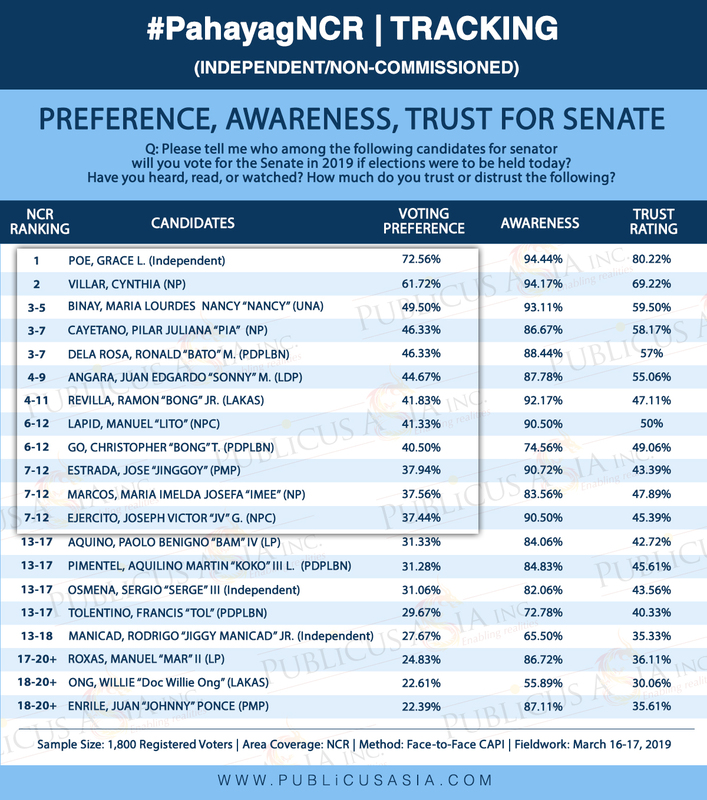 Respondents’ opinion were measured on the following: The public’s awareness of the 2019 senatorial candidates, the voting preference of the public upon the 2019 midterm elections and the trust ratings of the candidates running in the election. It also includes the awareness on mayoral/vice-mayoral candidates and the public’s voting preference and trust rating in each local candidate. Incumbent senators Grace Poe, Cynthia Villar, Nancy Binay and comeback legislators Bong Revilla and Jinggoy Estrada have the top five highest awareness ratings among the personalities. Rounding up the sixth to twelfth spot in terms of awareness ratings are Sen. JV Ejercito at 6th place, Senator Lito Lapid at 7th place, former PNP chief Bato Dela Rosa at 8th, Senator Sonny Angara at 9th place, former Senate President Juan Ponce Enrile at 10th place, former DILG secretary Mar Roxas in the 11th spot and Senator Pia Cayetano at 12th place. Rounding the top 20 are Sen.Koko Pimentel at 13th place, Sen. Bam Aquino at 14th place, Gov. Imee Marcos at 15th place, Sen. Serge Osmena in the 16th slot, singer Freddie Aguilar at the 17th spot, SAP Bong Go at the 18th place, Francis Tolentino at the 19th place and journalist Jiggy Manicad at the twentieth place. Grace Poe tops the list of the most trusted candidate at 80.22% rating. This is followed by Cynthia Villar at second place, Nancy Binay at the 3-5 spot, Pia Cayetano and Bato Dela Rosa at the 3-7th spot, Sonny Angara in the 4-9th spot, Bong Revilla at the 4-11th spot, Lito Lapid and Bong Go at the 6-12th spot and Jinggoy Estrada, JV Ejercito and Imee Marcos in the 7th to 12th slot. Outside looking in are Bam Aquino, Koko Pimentel, Serge Osmena and Francis Tolentino at the 13-17th slots and Jiggy Manicad at the 13-18th mark. Mar Roxas is in the 17th-20th slot with Willie Ong and Juan Ponce Enrile filling the rest of the top 20, ranking in the 18th to 20th spots. No opposition-aligned candidate made it to the top 12 in the current rankings. In the survey, most voters generally prefer Grace Poe as their candidate this coming election. She is followed by Cynthia Villar at the second place and Nancy Binay in the 3-5 slot. Both Pia Cayetano and Bato Dela Rosa are in the 3-7 slots and Sonny Angara solely in the 4-9th spot. In the fourth to eleventh spot is Bong Revilla. Lito Lapid and Bong Go are in the 6-12th spot. Rounding up the winners are Jinggoy Estrada, Imee Marcos and JV Ejercito, who all three are in the 7-12th spot. From 13-17 places are Bam Aquino, Koko Pimentel, Serge Osmena and Francis Tolentino. Mar Roxas is in 17-20 threshold while both Willie Ong and Juan Ponce Enrile at 18-20 spots. No candidate aligned with the opposition made it in the winners’ circle. In the mayoral elections, the tandem of Malapitan and Asistio remain virtually unopposed in Caloocan. In Las Pinas, Imelda Aguilar remains in a wide lead against her opponents and are expected to win in a big margin. In Makati, Abby Binay has a good lead over her brother, Jun-Jun. In Malabon, Lenlen Oreta has a good lead against Jeannie Sandoval. For Mandaluyong, Menchie Abalos have maintained a good lead against her rivals. In Manila, Domagoso has a wide lead against both Lim and Estrada. In Marikina, Marcy Teodoro enjoys a massive lead in the mayoral race. In Muntinlupa, Jimmy Fresnedi has the better vote firmness than his closest rival, Mark Marinas. In Navotas, Toby Tiangco remains the frontrunner against Dan Ang. In Paranaque, Edwin Olivarez leads against Jun Bernabe in the race. In Pasay, Emi Calixto has the upper advantage against Chet Cuneta. In Pasig, Bobby Eusebio holds a massive lead over Victor Sotto. In Pateros, Ike Ponce has a sizable lead over his opponent Willie Buenaventura. In Quezon City, Joy Belmonte, has the lead against Bingbong Crisologo. In Taguig, Lino Cayetano holds a lead over Arnel Cerafica. In San Juan, Francis Zamora has a double digit lead over Janella Ejercito. In Valenzuela, Rex Gatchalian has an insurmountable lead against his rivals. To inquire about the rates of the comprehensive report, contact PUBLiCUS Deputy Director, Mr. Jake Bergonia, at jarbergonia@publicusltd.com or via 0928 505 2010.